The fourth industrial revolution is well underway; Industry 4.0, originally coined by the German Ministry of Education and Research is the biggest challenge to cheap labour in the modern era. North American and European manufacturing sectors are creating ever greater efficiencies while making higher quality complex components thanks to higher investments in robotics, better software, and introducing the Internet of Things to the factory floor. 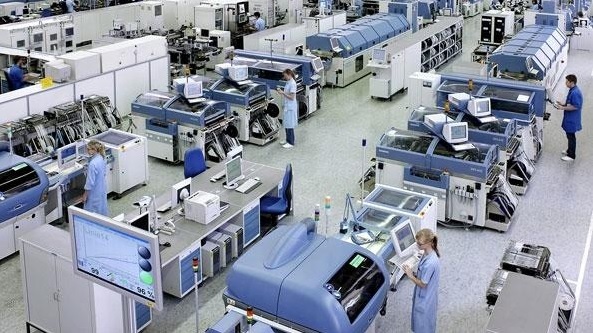 The birth of the smart factory is the most exciting change to manufacturing in decades and it also means a new wave of investment in better equipment, machine tools, and human-machine interfaces like touchscreens. Industry 4.0 demands smarter supply chain management, and at this point, that means real-time tracking of components and products during transit and warehousing. WiFi connected mobile computers that instantly upload data to a larger data management software are a must-have for any organization that wants to know where its products are at any given time. On-demand supply chains are possible, but they require connected, durable mobile computers and barcode scanners to track every component. Industrial PDAs and barcode scanners require tough resistive touchscreens that can withstand heavy and frequent use, environmental contamination, and work in extreme conditions, such as freezing temperatures or in areas with high electromagnetic interference. Touchscreen supplier A D Metro is one company that designs and engineers resistive touchscreens with their clients, based on the context of the application’s use. Depending on the environment an industrial PDA will be used in, it may need options such a chemically strengthened backer, adhesive mounting gaskets, or even be an upgrade to an ULTRA resistive touchscreen. The ULTRA resistive touchscreen from A D Metro is a tougher and more durable pressure-activated screen that is waterproof and resistant to impact or gouging, made with borosilicate glass. These screens can also be made with enhancements such as anti-reflective coatings, hydrophobic coatings, anti-glare coatings, polycarbonate substrates, and more. Unprecedented levels of data collection and analysis in real time lie at the heart of the smart factory and manufacturers need better human-machine interfaces to manage all of that data. All-in-one PCs or industrial monitors may need to make the jump to the projected capacitive touchscreen, which allows for multi-touch use and better optics. The goals of Industry 4.0 are self-organization and self-optimization, reducing errors, eliminating over-production, and achieving just-time in delivery. Better HMIs and displays are going to be a big part of the next big shift in manufacturing, and your company will need a superior partner in touchscreen manufacturing to provide the tools of the future.